The replace button on the form management page lets you replace one survey with another at any stage of the data collection process. There are no restrictions on what you can change and this can cause some issues if you change a question type. For example a customer had a question in their form “How far away from home is your work?”. They originally specified this question as “decimal” and had collected data where it was recorded as 3.0, 4.5 etc. However they later changed the type of the question to “text” and the submitted results contained values like “5 minutes”. Unfortunately these results were not being applied to the database so they could not see the later results. So if you then change a text question to a select there is no problem but if you change an integer to a text then the data will not load. So a bit cryptic but a problem with question type. Its trying to write some text into a decimal question’s database column. Usually the problem can be fixed simply from the Analysis module. Open a table view of your survey. This will show the results that have been loaded. Click on the icon “<” at top right to open the aside. There are two useful buttons here: “Delete Data” and “Restore Data”. However note the “warnings” section below before using them. If you are still testing the form select “Delete Data”. 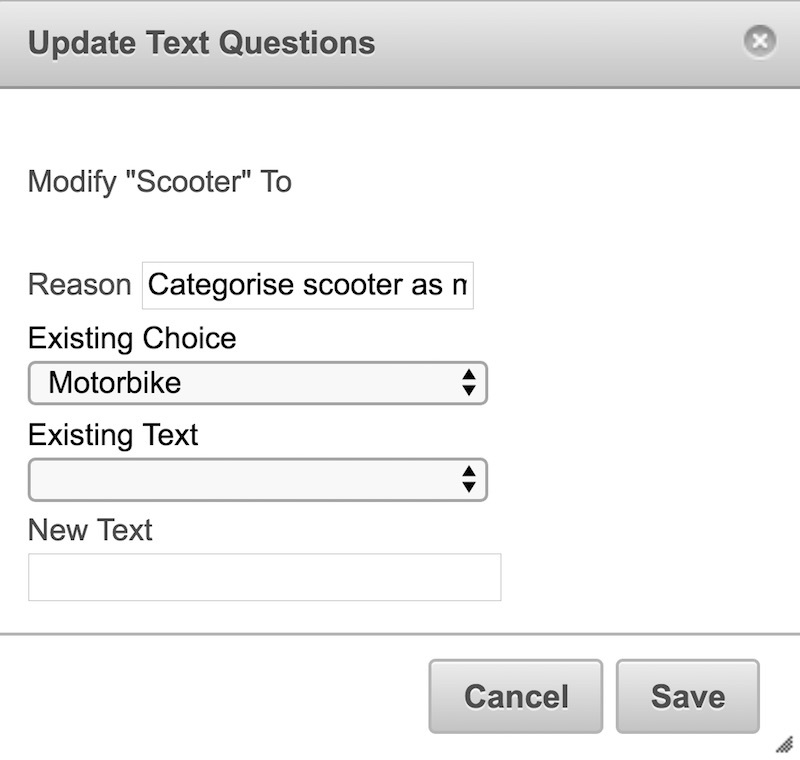 As well as deleting the test data this will also delete the tables that store the data so next time you submit some results it will recreate these tables but using the latest question types. In this case select “Restore Data”. This will also delete the tables but it will then reload all of the data from the original submissions. delete any modifications you may have made to data after it was collected. For example fixing spelling mistakes using the modify page. resend any notifications attached to your survey. For example you may be sending an email with a PDF containing details on each uploaded record. If you don’t want these emails to be resent then you can disable notifications while you do the restore. However any records that had failed to load due to the question type change will then also not trigger the notification. So tricky. Taking note of these warnings it is a good idea to change the data types of questions with care. This entry was posted in Smap Hints and tagged changing forms, hint, restore data on April 21, 2018 by Neil Penman. Announcing another “Product” from Smap. These products consist of form templates for and instructions on how to set them up on a Smap server to address a specific objective. Or at least start to address that objective as you will want to customise the forms to suit your needs. The accountability product includes 2 forms the first of which is a feedback form that can be completed on a mobile phone or in a web browser. The second is an oversight form that is attached to the feedback form and that can then be used to record actions taken in response to the feedback. 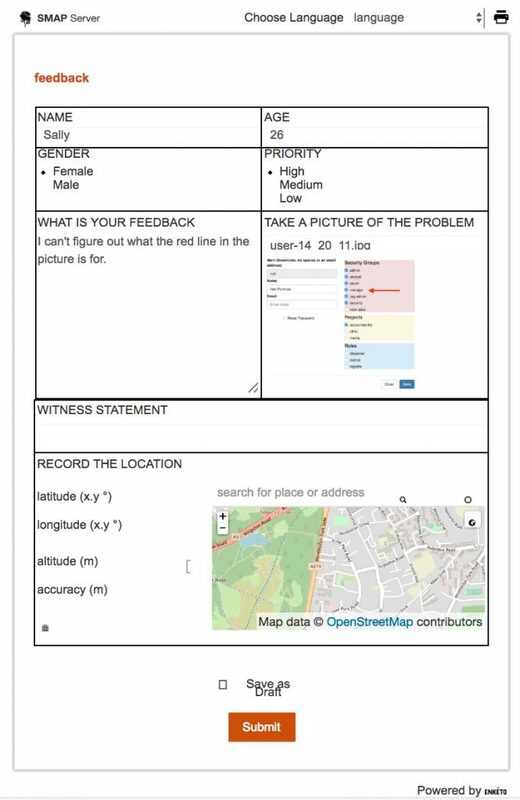 The feedback form is just a standard form that can be completed in the fieldTask application on a phone or tablet as well as in web-forms in a browser. If you were taking feedback in a call centre then you would presumably use web-forms. Alternatively if you were in a remote location without data connectivity then you would probably use fieldTask. Responsible person. 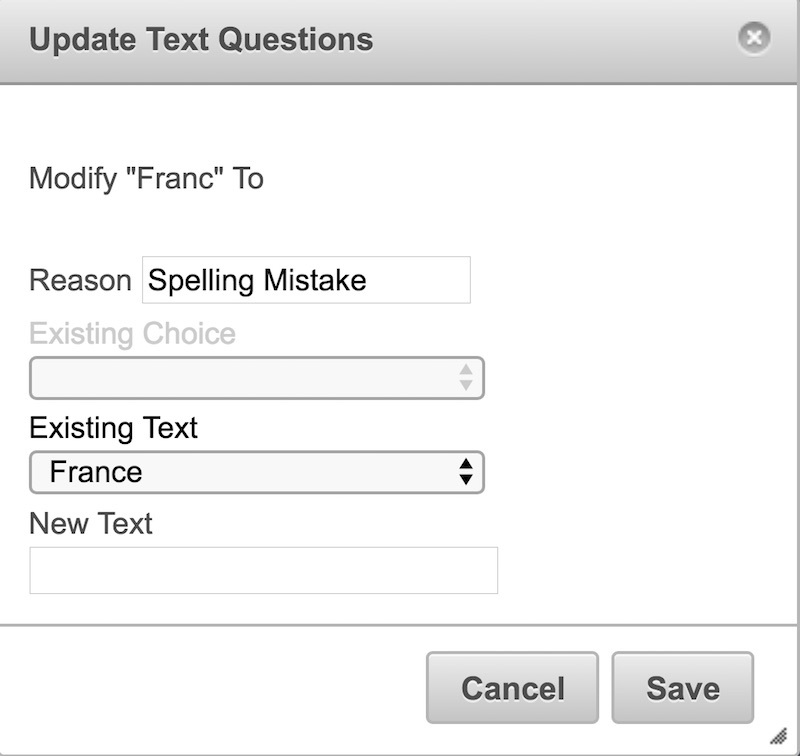 A text field to enter who is responsible for processing the feedback. This has the same name as the priority question in the feedback form and hence it shows the same value. The priority can however be changed from the value initially set in the feedback form. Translation of Feedback. This is a text question that is linked to the feedback description set in the feedback form. Transcription of the issue statement. The manager can play the audio statement and type the text into the text field. Image labels. The labels shown were generated automatically by Amazon Rekognition. However they can then be manually modified by the user. You can download a zip file containing this product and a PDF with instructions from the Smap Products web page. This entry was posted in Product and tagged accountability, feedback, product on April 6, 2018 by Neil Penman. If you change an image or other media file that is used in a question or choice then that new media file will be downloaded automatically to the mobile device using push notifications. A media file, including a CSV file, will now only be downloaded to a phone if it has changed. Media and CSV files are only downloaded once if they are used by more than one form on the device. In other words as long as the media file is coming from “Shared Resources” it is also shared between forms on the device. If the media changes but the form has not changed then the form is not re-downloaded only the changed media files are. You have a form that uses many images in questions and choices but you are making changes to that form by adding new questions or changing the question text. Now after each form change only the new form will be downloaded and not all the images. You have a csv file that is constantly being changed. Now only the changed csv file will be downloaded and not the form and any other csv files or media. However performance may be slightly worse if you have many forms that use media and only one is updated. The reason being that during refresh the manifest will now be checked for all the forms that use media to see if the media file has been changed. Previously the change in a media file would not have been picked up and the form would not have been updated on the device. This is a quick operation and will only be noticed if the number of forms is quite large. The number of records that match the filter as well as the total number of records will be shown just above the table of data. Issue. The Legacy XLS export does not allow select multiples to be split into separate columns. Issue. Replacing a survey that used uncompressed select multiples results in the select multiple questions being converted to compressed but the old data is not converted making it invisible. This entry was posted in Uncategorized on April 3, 2018 by Neil Penman.